choir croak out them goodies: The Kooks! Konk. Terribly dazzling about the Kooks’ debut, Inside In/Inside Out, was how it deliciously reeked of high school infatuation and bore its influences proudly. And why not? The band was exceptionally young and genuinely didn’t know any better, and that's what made them such lovable characters. In their early twenties, the boys from Brighton have hit an odd slump with a sophomore record that is all too aware of the pressure that comes with being an adult songwriter. 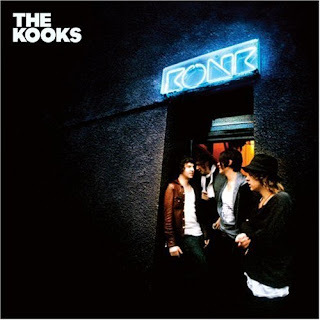 This slump, though, isn't all bad, and is more easily criticized because of the way it contrasts with the Kooks' debut, a record which was easy to latch onto by the end of first listen. What's in this mixed bag? Konk’s title pays homage to the Ray Davies-owned studio at which it was recorded, and still the only blatant Kinks influence here is the story within “Mr. Maker,” an update on “A Well Respected Man.” The full record revolves around a love lost or long-distance – as of last year Pritchard was dating a lucky lass in New York – and the lyrics that comprise it are painfully corny (“I need your soul, cause your [sic] always soulfull [sic]”). There's a by-the-numbers Kooks in “Always Where I Need to Be,” but there’s hardly a hint of reggae influence to show off Paul Garred’s Copeland-influenced drumming, which we saw quite a bit of on Inside In. The only exception being “Tick of Time,” where we also get to hear a lovely, timid voice that almost certainly belongs to guitarist Hugh Harris. Konk is half-sweet, half-glossy, its finest songs those which are stripped down, like the aforementioned “Tick of Time” and hidden track “All Over Town.” Even “See the Sun,” though involving the full band, is simpler than a fair number of the pop tracks, and its chords beautifully match the tone of loneliness that its lyrics convey. “Do You Wanna,” on the other hand, is a big cheesefest, an odd attempt at seduction by a vocalist whose voice hasn’t caught up with his real age, topping off an unexpectedly disco-style balance of the Rolling Stones’ “Miss You” and Franz Ferdinand’s – yes – “Do You Want To.” And all of this nonsense is kicked off with a bar-ready, rough and twangy guitar riff by Harris, a touch that epitomizes cheese in itself but is brought by a guitarist who otherwise has a good deal of talent and adds nicely to the album's remainder. *This applies so long as intensely loyal fans of former bassist Max Rafferty don't boycott the group once it begins its first Maxless recording! OH MAN! Your writeup had me so excited....then the file wasn't there to get. Do I sense some sarcasm, TND? I've never known anyone to get excited over a mixed review! Golly. I tried downloading a Kooks track from someone else's blog and got the same message as when I clicked on my download link. I get the feeling Virgin Records has been doing some quick removals...try one more time before they get to my re-post?